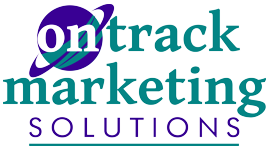 On Track Marketing Web Design and Development team uses the latest content management platforms and web technology that allow our clients to easily maintain their own content and a customer database for email campaigns. We also employ the latest usability features including rotating services and tabbed content to eliminate scrolling and the need to drill down to sub pages. The end result is a lower visitor bounce rate and higher search engine results as much of the content is accessible on the home page. From WordPress, to Joomla or Drupal our web sites are set up for the addition of advanced functionality as your company may require: eCommerce, directories, social sites, memberships and subscription site. And, because our websites are database driven, future upgrades and design and template changes will not affect the content of your site. Think of our sites as a website that can grow as your company grows. Let our design team assist you in designing your website concept as well as logos and graphics for your printed collateral from business cards to brochures to ensure a consistent brand and image throughout all avenues. Contact the Design Team at On Track Marketing to discuss what we can do to boost your image.